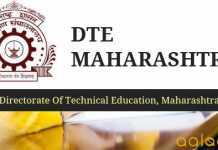 DTE Maharashtra Direct Second Year Engineering / Technology Admission 2018 – Directorate of Technical Education has released the notification for the eligible candidates for admission to Direct Second Year of Engineering and Technology (B. E./B. Tech.) for the Academic Year 2018-19 in the Maharashtra State. Candidates can check the complete information of DTE Maharashtra Direct Second Year Engineering / Technology Admission 2018 application process, eligibility criteria and other information on this page below. Latest: Notice regarding College/Course Registration and Admissions approval Process has been released. Candidates can check for the same from below. Interested and Eligible candidates have to fill online application for admission into Direct Second Year Engineering / Technology from here. The Competent Authority, the Commissioner of State Common Entrance Test Cell, Maharashtra State, shall be the authority for Centralised Admission Process and shall direct the students as per their allotment through CAP to all institutions i.e. Government, Government Aided, Unaided Institutions. Candidates who have been allotted the seat as per first preference in Round I or freezed their allotment in Round I and reported to ARC. Candidates who have been allotted the seat as per first preference in Round II or freezed their allotment in Round II and reported to ARC. Directorate of Technical Education has published the Provisional Allotment of CAP Round on the official website. Candidates can also check it through the link provided below for the sake of candidates. Click here to View Provisional Allotment CAP Additional Round. Click here to check Provisional Vacant Seats for Additional Round. Click here to View Provisional Allotment CAP Round – III. Click here to check Provisional Vacant Seats for CAP Round II. Click here to check Provisional Vacancy for CAP Round II. Click here to check Provisional Seats Vacancy After CAP Round II Allotment. Click here to check View Provisional Allotment For CAP Round – II August 04, 2018. Click here to View Provisional Allotment CAP Round – I.
Click here to check Provisional Seat Matrix for CAP Round I. Provisional Merit List for Admission to Direct Second Year of Four Year Degree Courses in Engineering / Technology for the Academic Year 2018-19 has been published by DTE Maharashtra on the official website. The merit list has been prepared on the basis of marks obtained by the Candidate, on the basis of which Diploma / Degree is awarded by the examining authority. Click here to check Final Merit List For Maharashtra State Diploma Candidates. Click here to check Final Merit List For All India Diploma Candidates. Click here to check List of not eligible Candidates. For discrepancy if any, in the provisional merit list, Candidates can submit the grievances in written along with required documents at Facilitation centre where candidate has confirmed application form within the specified grievance period given in the schedule. No document shall be accepted to substantiate the claim made in application after scheduled dates. Symbiosis B.Tech Admission 2019 - Apply Now !! Provided that students belonging to this category shall clear the subjects of Engineering Graphics/ Engineering Drawing and Engineering Mechanics of the first year Engineering Program along with second year subjects. Sons and daughters of Central Govt. / Govt. of India Undertaking employee Type “C” A Candidate who does not fall in either Type A or Type-B but whose Father or Mother is an employee of the Government of India or Government of India Undertaking and who has been posted and reported to duty in Maharashtra State before the last date for submission of Application Form for CAP. Sons and Daughters of Maharashtra State/ Maharashtra State Undertaking Employees. Type “D” A Candidate who does not fall in any of the above Type-A, Type B and Type-C but whose Father or Mother is an employee or retired employee of the Government of Maharashtra or Government of Maharashtra Undertaking. Candidate From Disputed Maharashtra Karnataka Border Area and whose Mother tongue is Marathi. Type “E” Candidates passing SSC and/or HSC Examination and also Diploma in Engineering and Technology or its equivalent from a recognised institution from a Disputed Maharashtra Karnataka Border Area or from Maharashtra, residing in the Disputed Maharashtra Karnataka Border Area and whose Mother tongue is Marathi. Direct Second Year Engineering and Technology: The eligible candidates are required to fill the application form Online. The Application Fee for General Category Candidates, Outside Maharashtra State Candidate and Children of Indian workers in Gulf Countries, is Rs. 800/- and for Reserved Category candidates from Maharashtra State and Persons with Disability candidates from Maharashtra is Rs. 600/- . The candidate should fill the Online Application Form as per the schedule. The list of the Facilitation Centers is also published on the here. The Facilitation centre shall facilitate the candidate to fill the Online Application Form, scan and upload the required documents without any charges. Filling Online Application Form by Candidate for participation in the Centralised Admission Process. The Candidates can only fill Online Application Form and upload the scanned copies of the required documents. Candidates are required to fill in all the details as per the instructions. Pay the application fee. The list of the Facilitation Centers (Click Here) shall be available on the website.The facilitation center shall facilitate the candidate to fill the Online Application Form, scan and upload the required documents without any charges. After completion of the information and submission of Application Form, the Candidates are required verify the data filled and correct, if required. There after candidate shall take printout of the form and sign on it. The Printout of form shall have list of documents required to be produced by the candidate for substantiating his claim made in the application form. Candidate can edit/update the information in his application form before he confirms it at any of the Facilitation. For Complete Details of DTE Maharashtra Direct Second Year Engineering / Technology Admission 2018 – Download Notification | Information Brochure. i appear in electrical engg in diploma this year can i get the admission in computer science indirect second year in degree? Yes you are eligible for it. can you please tell me the dates of admission to dsy in mechanical engineering . Sir, I got a compartment in 12 th and scored 54% . I m eligible for 2 yr diploma for direct admission or not. There is no a single date for any idea of admission please tell me..
Sir, Gulf or NRI Quota is available for direct second year of engineering . If ,it’s available what is the procedure of this? Sir, tell me about cap round date for B.E when strat its? I have completed my diploma from Gujarat. Can I get d2d admission in Maharashtra? I completed my diploma in computer engineering in 2002 with 58% I wanted to cimplcom my BE. am I eligible now for the course. While filling the form for direct second year engineering in the option main group sub group and other group courses are shown if I select the main group as mechanical and other group as computer then what that’s means. can i apply for direct second year BE now ??? Hey there! yes you can. The CAP II list which is declared on 4th August has changed on 5th August. Hello sir,I have completed my diploma in extc engineering and I want to get a admission on dte code (1128) electrical engineering but I didn’t got allotment in cap round 1 and 2 plzz help me sir what I to do …? you should have studied from an institute from Maharashtra or should be born in Maharashtra. If not your father mother should have a domicile of Maharashtra and you can go through eligibility criteria.